Thisilyn Cleanse is produced by supplement company Nature’s Way. This detoxification protocol contains a proprietary form of silymarin extract from the milk thistle plant. This herbal remedy has been used for hundreds of years to promote liver health, immune function, normal digestion and general well-being. There are two primary Thisilyn Cleanse kits: Thisilyn Cleanse (Mineral) and Thisilyn Cleanse (Herbal). Both products are prolonged cleanses with a duration of 15 days. Each kit contains products for three phases: whole body detox, 6-fiber blend and digestive sweep. The mineral and herbal versions of Thisilyn Cleanse differ in the third phase or digestive sweep: the herbal formulation uses cascasra sagrada, an herbal product derived from the bark of Rhamnus purshianus while the mineral cleanse uses magnesium hydroxide. Nature’s Way advises beginning all three formulas on the same day and drinking plenty of water throughout the process. What are the benefits of the Thisilyn Cleanse products and how does milk thistle extract promote liver function and detox? Many opt to undertake cleanses to support liver function and improve digestion. The liver is responsible for filtering the body’s blood and, when it is functioning properly, can filter the vast majority of toxins, bacteria and heavy metals. The liver also produces bile that helps with digestion. 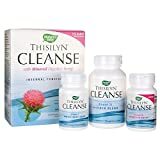 Consumer reviews of Thisilyn Cleanse products are generally positive, but users note that the process does require taking many pills over the course of the cleanse (up to 11 capsules a day). Thisilyn is a proprietary milk thistle extract produced by Nature’s Way. It is used in a number of the company’s products and is standardized to contain 80 % silymarin. Silymarin is a flavonoid complex composed of three different flavonoids: silibinin, silidianin and silicritsin. This complex is concentrated in the seeds of the milk thistle plant (Silybum marianum), a plant that has been used for millennia in the treatment of liver and gallbladder disorders. Contemporary research indicates silymarin possesses antioxidant and anti-inflammatory properties and hepatoprotective (liver protecting) effects. In particular, it may help prevent liver damage and support the growth of new liver cells. Turmeric is an antioxidant and anti-inflammatory herb that is commonly used to support digestion and increase bile production by the gallbladder. Artichoke is used to support the flow of bile from the liver to the gallbladder. The second phase of the cleanse also lasts 15 days and involves taking three capsules twice a day with at least 8 oz of water. The capsules contain six fiber sources, including psyllium husk, flaxseed fiber, acacia gum fiber, grapefruit pectin, guar gum and fructooligiosaccharides. In total, each capsule contains 1 g of dietary fiber. Thus, in Phase II each individual will consume 6 g of additional dietary fiber. The main ingredient in the herbal cleanse is cascara sagrada, which is obtained from the dried bark of the plant Rhamnus purshianus. This plant is used medicinally but is also poisonous. Cascara is produced by aging the shrub’s bark for at least a year because the raw bark is too strong a laxative to be safely used. The active components of cascara are called antraquinones. Cascara is commonly used as a laxative but has also been historically used for gallstones and liver ailments. Nature’s Way recommends users take 2 – 3 capsules at bedtime for no more than 10 days. Thisilyn Cleanse (Mineral) contains magnesium hydroxide instead of cascara. Various forms of magnesium, such as magnesium hydroxide, are used to treat constipation. Nature’s Way notes that magnesium helps clear the bowel in a non-stimulating way, as opposed to peristalsis caused by cascara. The company describes the mineral form as the gentler alternative. Users are advised to take 3 tablets before bed for 8 days, followed by 2 tablets before bed for an additional 7 days. User reports indicate that Thisilyn Cleanse may cause bloating, gas and other adverse reactions, but that it is generally well tolerated by otherwise healthy individuals. However, both the herbal and mineral cleanses contain many ingredients that each carry risks of different side effects and drug interactions. Also, because the mixtures are designed to target the liver, gallbladder, bladder and digestive tract, they may aggravate pre-existing health conditions. Speak with your doctor before undertaking a Thisilyn Cleanse to make sure the product is right for you. Cascara: Professional Monograph. Natural Medicines Therapeutic Research. Reviewed 10 Feb 2013. Updated 5 Mar 2015. Accessed 25 Jan 2016.